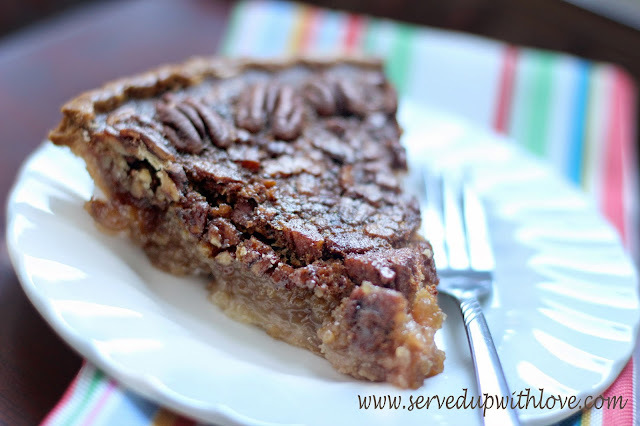 Who doesn't love a good ole southern pecan pie? Do you say Pah-can or Pe-can? When I took a poll a while back on my Facebook page it was funny to see how it was pronounced everywhere. Well here in Virginia (where I am) we call it Pe-can. 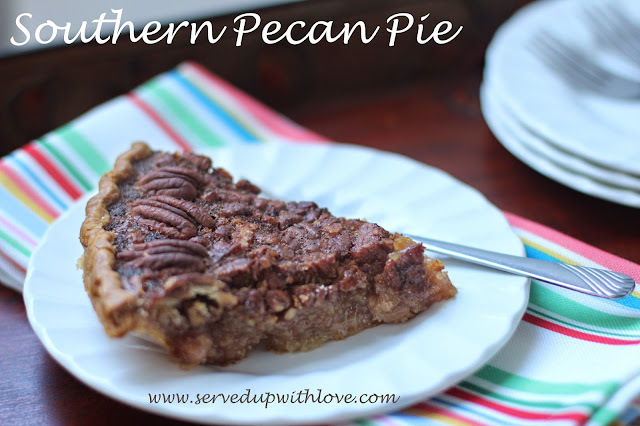 Either way you pronounce it, this pie is fantastic. 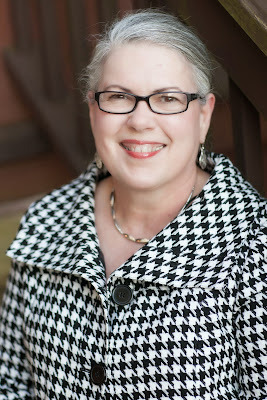 I would like to introduce you to Kay Little, from Cooking with K. We met in October at the Southern Food Blogger's Retreat. We hit it off almost immediately She is just the sweetest person you could ever meet. You could hear how much she loved her family as she talked about them. If you have ever visited her blog, then you know what I am talking about. We could just sit and talk forever. The only problem is, she is all the way in East Texas and I am in Virginia. If only we were neighbors. I just know that we would meet every morning on the porch to chat over coffee. Now, I saw her recipe for Southern Pecan Pie and I knew this had to be the recipe for me to try. 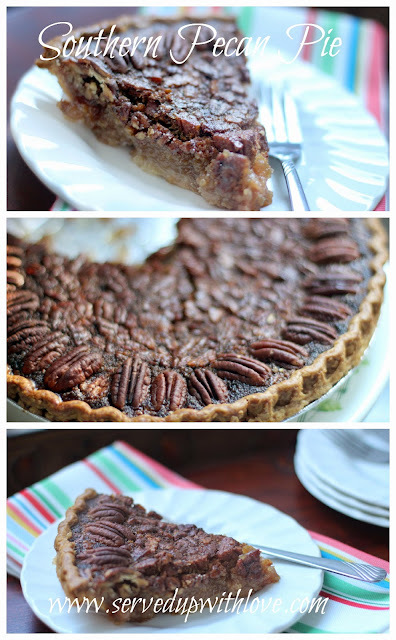 I had made a pecan pie many years ago but had not ventured back to making one. Her mother and her mother in law both made this pie a little different. 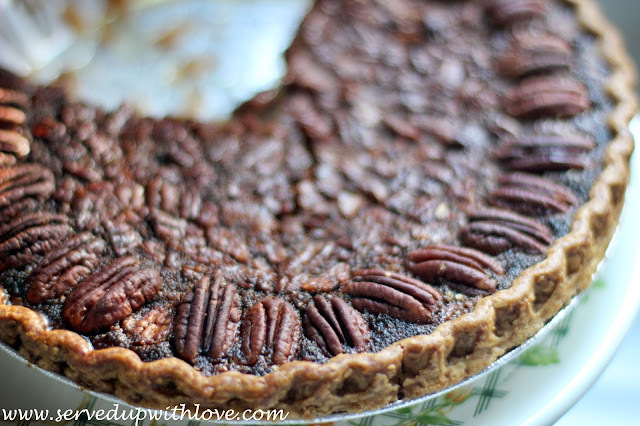 Her mother used chopped pecans and his mother made hers with whole pecans. For years Kay made two pies, one of each, each year. That is until she combined the two and this one was born. Marrying the best of both worlds for her family. I love how pretty this pie looks, but even more how good it tastes. I love reading through Kay's recipes, especially those of her mothers. My Grandmothers recipes disappeared along with them when they left us and I don't have those to remember them by. So I am always drawn to those tried and true recipes of the generations before us. Thank you Kay for sharing those wonderful recipes with the world. I am so honored to call you my friend and I am so thankful we were able to meet. I sure do miss you my friend and I am super glad we were able to meet. It was only a couple of days but I will treasure them always. I know there are many, many miles between us, but that does not mean we can't enjoy a cup of coffee together. Even if it is over Facebook! If you have not visited Cooking with K, please do so! You will be glad you did. 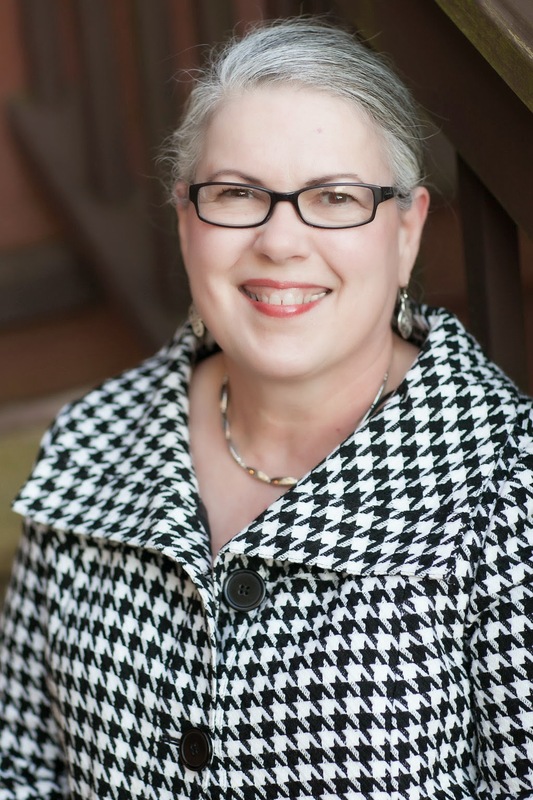 You are so warm and gracious…Southern hospitality at best! We are neighbors in spirit for sure. Happy Thanksgiving to you and your family….Blesssing sweet friend! Coffee and Pie, coming right up! Happy Thanksgiving to you and your family too! Thanks Betty, what part of Va are you in?